Marines often say that one of the biggest reasons they read Marine Corps Times is for the stories on pay and benefits. If so, consider this week’s issue meat-and-potatoes coverage at its finest. Congressional editor Rick Maze delivers a cover story this week outlining 13 changes to the Post-9/11 GI Bill. They include perks like extending an existing $1,000 book bonus already available to student veterans to spouses and active-duty service members. The bill passed through Congress last week in a surprise. It’s considered a compromise among veterans groups, schools and the Veterans Affairs Department to gripes that existed with the GI Bill. 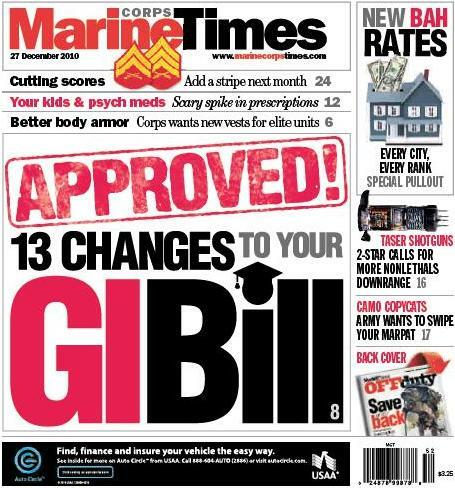 This week’s Marine Corps Times also includes a full pull-out chart outlining the BAH rates for every city and every rank in the service. Check it out on newsstands now or subscribe here and see it right now.